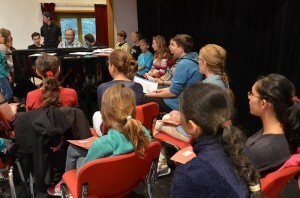 The Janáček Philharmonic Youth Choir was established in September 2014. This young choral ensemble began life as a mixed choir under the leadership of the experienced choirmaster Jiří Slovík, and in December 2014 the choir and the JPO performed at a Christmas concert and an advent concert in the Nová Karolina shopping and entertainment centre. Since January 2016 the choir has been working as two separate ensembles: as a children’s choir, and as a mixed youth choir. Their huge enthusiasm and hard work push both of them forward – the choir is currently preparing for international competitions, concerts abroad and further cooperation with the JPO. Rehearsals always take place at 5 PM at the JPO. The younger ones meet and sing on Monday and the slightly older ones on Thursday. If you like singing and would like to try out choral singing, pay attention to the recruitment drive for new members, which will take place in June and September, always at the time of rehearsals.